After the death of her father, estranged daughter Morgan (Rachel Amanda Bryant) returns to her hometown for the funeral. While she is at the funeral she crosses paths with her sister, the sister that her father loved more then her. Morgan doesn't shed a tear for her father, after all why would she, as he kicked her out of the family home before her eighteenth birthday. Once the funeral has ended, Morgan heads to her fathers office to steal some valuable items. One of these items is a very valuable golden arrow with a huge gem in it. Unfortunately for Morgan, her father brought this item back from a archaeological dig many years ago. During the dig he made a deal with the devil, promising his soul but he turned his back on the deal and now Morgan must pay the price. As she repeats the night in true GROUNDHOG DAY (1993) style and ends up dying again and again, a bit of her soul is taken by the devil. Her repetitive night sees her meet masked killers, zombies and the devil himself. Morgan must find a way out of this nightmare before the devil gets every part of her soul and she is tormented for eternity. THE CAMPUS is held together by a strong performance by actress Rachel Amanda Bryant as the unlucky Morgan. At times the soundtrack brings to mind the wonderful score of THE FOG (1980) alongside its 1980's inspired synth score. Director J. Horton has given the film a tightness which is lacking in modern day films, where most films now stretch to two hours or longer this film sits neatly at just under an hour and a half. As far as the red sticky stuff goes there is plenty to see including a moment where Morgan will need more then a plaster to cover up her wounds. 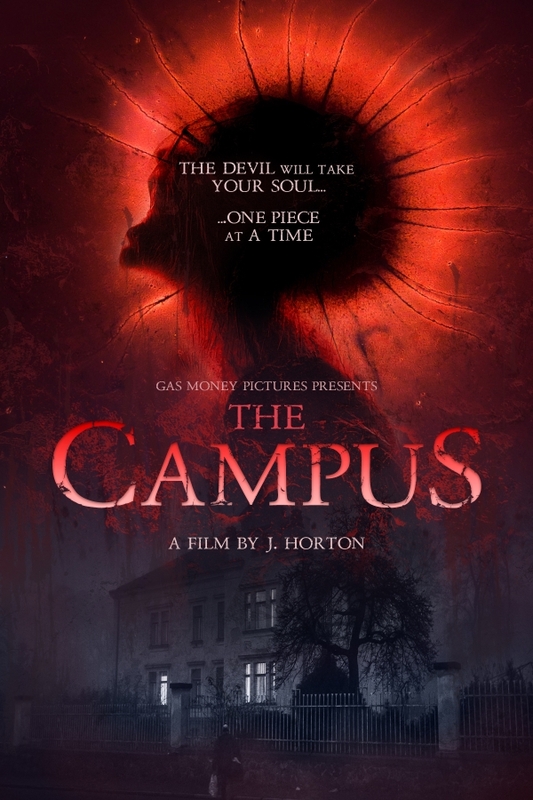 The suspense level is high in this film and with a character that you want to see make it all the way through it makes for a enjoyable horror movie experience.